So you are following your amigurumi pattern and at some point it tells you to "weave in ends". What does it mean and how to do it? Weave in ends means hiding the ends of the yarn so that it doesn't show in the finished work. In an open ended piece, if you know that the inside isn't going to show and you know that you don't need the end anymore simply hide the yarn inside the piece after finishing it off. If you want your ends to be a little more secured and neat, or if your are working with a flat piece, hide them under the back of the stitches. 1. Insert the needle under the upside-down "V"s in the back of several stitches. 2. Pull the yarn and cut the end. 1. Insert the needle under the horizontal bar of the stitch and pull the yarn. 2. Repeat several times for the next stitches and, when satisfied, cut the yarn. When you know you're not going to need the ends. 1. After closing the 3D piece, thread a tapestry needle with the yarn. Insert the needle through the middle of the last round and make it come out as far as possible from this point. 2. Pull the yarn until the knot from the finish off disappears into the piece. 3. 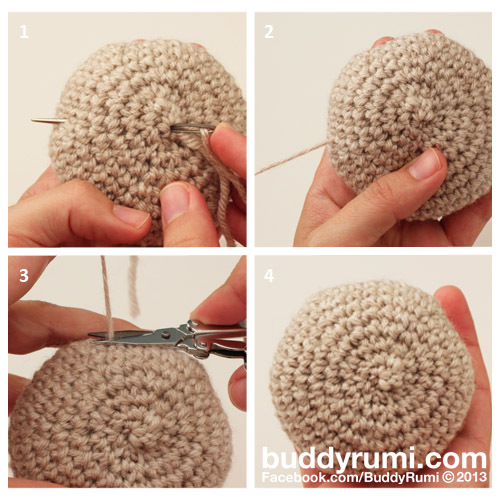 Pull the yarn tightly and cut it close to the piece. Be careful not to cut your work. 4. The end will disappear inside the piece.